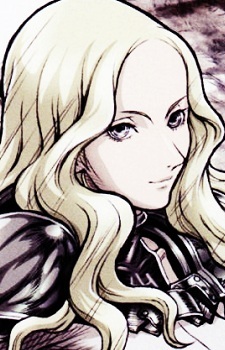 Teresa "Teresa of the Faint Smile"
Teresa of the Faint Smile, known for effortlessly slaying enemies with a faint smile on her face, is the strongest of her generation and considered to be the most powerful Claymore of all time. She is much faster, stronger, and more agile than those below her, but her real strength is considered to be her "unparalleled ability to sense Yoma aura." She can sense it to the point where she can accurately predict her opponent's moves in battle. Despite facing an awakened former number one, Rosemary, she has never used more than ten percent of her full power, which is only enough to change her eye color. Before becoming a Claymore, she was referred to as a "problem child" by her handlers during her training. Teresa initially does her job without caring about who she is helping, and she takes pleasure in scaring humans. She eventually meets Clare, who decides to start following Teresa after being abandoned by her village. Teresa is initially irritated, but soon grows fond of her. After leaving Clare in a village in an attempt to give her a normal life, bandits raid the village. Teresa kills all of them, which causes her to be hunted by the Organization for breaking the rule of never killing humans. She doesn't kill any of the Claymores after her because of her time with Clare, but she is slain by Priscilla offguard when Priscilla begs to be slain before awakening. Clare takes her severed head and convinces a member of the Organization to use it in place of a Yoma to turn her into a Claymore. As Clare and Priscilla fight their final battle against one another, Clare releases all her Yoki, awakening Teresa who is revealed to be alive within Clare. It is this that allows her to once and for all defeat the One-Horned Monster. As Clare's body begins to return to normal, she begs Teresa to stay, but before they bid farewell to one another Teresa assures her that she will always live on in her heart.